In Sulawesi, there are 2 places called Makasar. One —with two s— is the name of the town which became the capital of South Sulawesi province. Other makasar —with one s— is a small island covering 138.8 hectares in the bay BauBau, Southeast Sulawesi. Its population is only 5000. Almost all citizens make a living as fishermen. Therefore, the city government of Baubau declared the island as the center of the region’s fishing industry and tourism. 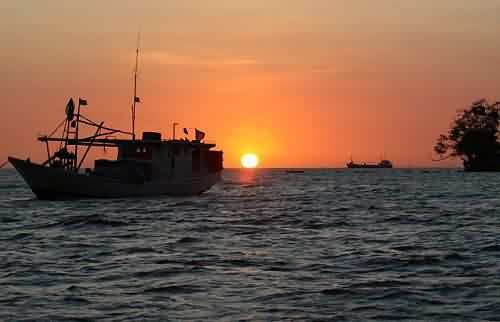 However, the beautiful shoreline and exotic scenery at sunset make the island into a tourist destination. Moreover, it stores the history of the island kingdom of Buton. In addition, the island has unique culture which is not found elsewhere. So, it’s not wrong if we choose makasar island —or known as purna among local villager— as a place of pleasure. The best time to visit the island is July. 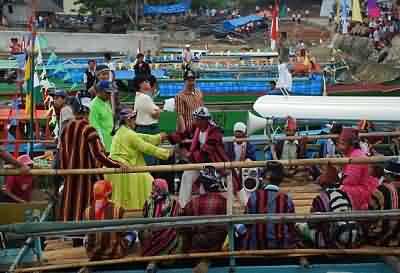 That’s when the waters festival would be held in makasar island which is mentioned the national tourism calendar. The festival was driven from the tradition of island communities known as tutturangiana andaala. Translation: the sea ritual as a form of gratitude to the God. The ritual’s formed as a parade of decorated boats. Typically, hundreds of fishing boats following the parade, which starts from the Makasar island to Kolema coast on the Baubau mainland. As a supporter of the event, there are several other tourist attractions during the festival took place. for example, dragon boat, banana boat, Jetski, flying fish, pekande-kandea, beach volleyball, traditional pools, and traditional rowing. And as the closing event, there is evening art featuring Baubau unique art.